I am compelled to say something about this picture and this girl. We cannot look in her eyes without tearing up ourselves. Islam hurts little girls. Islam sends young boys to their death by suicide bombing. Islam turns men into oppressors. Islam turns women into the oppressed. Sharia Law oppresses anywhere it is enforced. I am always in favor of freedom of choice and freedom of religion. Yet the truth matters. The only reason liberalism is sympathetic to Islam is because liberalism says man is the center of all things which means liberalism rejects God’s authority and Christianity’s primacy… so that Liberalism is opposed to Christianity just like Islam is and so liberalism and Islam have a common enemy… which is very easy to see in our culture and our media. The caption for this picture reads, “A displaced Iraqi girl, who fled her home, cries during a battle between Iraqi forces and Islamic State militants, near Badush, Iraq, March 16, 2017. If you insist that Islam is a peaceful religion then tell my why Jihad is in the Koran, and why Sharia Law is in Koran, and why is kill the infidels in the Koran? Plus a whole host of other oppressive statements regarding Christians are in the Koran. In the end this young girl’s tears tell the whole story. She is innocent of all wrong-doing yet she suffers. If the media was not so deluded because they reject God and obsessed with attacking Trump then they would run Op-Ed pieces like this. God wagers a great risk when He creates each and every human being. God refuses to violate our free will so the risk is that we will do significant evil instead of good. He also risks the fact that someone He created will never acknowledge His creating them nor the bridge that His Son provides. And so we get both ends of the spectrum. A person like Mother Theresa chooses great good. And unfortunately a man chooses evil and the Las Vegas massacre happens. Sin is a matter of violating the design and intentions of our Creator. God did not design one human being to take the life of other human beings in a wanton and malicious manner. The Las Vegas massacre is a very nuanced matter. There are many factors to consider. But in the mix is this axiom to behold, “Blessed is the nation whose God is the LORD,” which is a verse in Psalms in the Bible. And since these mass murders and terrorist attacks keep plaguing our country then that should give us great pause to consider why. It is false to say God would cause something like the Las Vegas massacre. But there is this dictum of God removing His hand of protection from a nation that has turned their back on Him. There is this deception and fatal consequence for a groupthink that supposes man can depend on his own righteousness, merit and self-sufficiency. There is also this principle in the Bible, “yet he does not leave the guilty unpunished; he punishes the children for the sin of the parents to the third and fourth generation.” So if Stephen Paddock’s father chose the evil of robbing banks, broke out of prison, was on the FBI’s Most Wanted list and had the diagnosis of psychopath, then we have a perfect and catastrophic storm brewing unless there is some sort of intervention. Las Vegas and its surroundings are not known for producing specimens in right standing with God. So Las Vegas nurtures the son of a psychopath with the vices of gambling, “escorts” also known as prostitutes and alcohol. This elixir can produce nothing but evil. I am not saying Republicans have answers – they do not. I am saying God does. And modern liberalism is nothing but a strong delusion. Give no regard to the myopic subterfuge called “the separation of church and state” which is not in the Constitution. If you want answers that matter about the tragedy Las Vegas then ask the God of the Bible who gives wisdom to those who seek Him with all of their heart. Job is a fascinating character on many, many levels. His life was about 2100 years before Christ. That is to say Job lived his life without any revelation, as far as I can tell, of Christ. And Job lived his life about 600 years before Moses. This means that Job did not have the Law to guide him or give him direction. So, Job lived a very close walk with God not having the law from Moses and long before Jesus came. BTW – not saying that Job didn’t need Christ’s sacrifice – he did. He just lived before Christ’s sacrifice and needed it just as we all did and do. But this is still amazing to me. And is might bring a bit more insight to Romans 1 which says God attributes are evident through nature and men are without excuse regarding God. I would guess that God gave Job all of the wisdom that he needed to live a righteous life, but also Job had a heart that sought God. But is the midst of losing everything Job still says, “Though He slay me yet will I serve Him.” So a Christian can lose everything that the world values, and that we all value, but Christians still know that God is still sovereign, That God is still out Creator, that Christ still died to redeem us, and even if our only consolation is heaven some day it is still right and proper for us to serve God and honor Him. We don’t serve God because He is a vending machine… even though there are things I might want or need. So let me apply this to my circumstances. I have a chronic illness. I cannot work. I cannot live the American dream. I can’t really be prosperous. I am dependent on many, many people to stay alive and survive. I would guess that at least half of the people in the Third World live a better life than I do. I am not sure such a comparison is appropriate but I am just trying to explain my situation. But, because I cannot get healed, or live a prosperous life, or work – which most men find their purpose in, does that mean it is pretty much useless to seek God or try and serve Him? Well I have to serve God for who He is and not because of what He gives me. At some point I have to serve God for who He is and not what I get out of it. And that is real Christianity. Satan told God that Job just serves God for what Job gets out of it. But that is a lie. And Job proved it was a lie and Job proved God right. Yes I struggle greatly but there is no other ballgame. Jesus is the way, the light and the truth. So if I do not serve God then I will serve something false. I hope I explained that in a way that makes it real. Let me try this. Jesus said that He came so I would have life and have it more abundantly. I can promise you that most people look at my life and say geez… I don’t want to have to live like that. Chronic, never ending health issues… please spare me. But I am with Job… I have to be. And he was a really great man, I am not, but still, Job’s conclusion is the correct one. Though He slay me, though I have a chronic illness, though someone has cancer, though the disasters of life hit very hard, yet God is still God, He still created me, and Jesus still died for me and has a claim on my life, so against all odds, against all adversities, against all struggles, against anything that comes at me in this life, still I will serve God. And that is the very end of the matter. I am completely humbled by this lady’s words. She gets it… far better than I do. So I am re-posting it here. There is no question in my mind that we Christians… some of us anyway (including me)… as well as many in our culture suffer this “ontological lightness” and so the distractions, the, “hollow entertainment” and the business of life keep us from the, “weighty things.” There is a purpose to my suffering… and yours. BTW – I substitute suffering for sadness because that is what identify with more. Too often we find ourselves here. Waves of emotions overcome when we least expect them. While I’ve learned a lot about choosing light, daring to hope, hard thanksgiving, and spiritual battle, there are lessons yet to learn. The more I consider these emotions I’d rather not experience, the more I see multiple reasons that depression—yes, depression—has been a gift to me. Here are five. Sadness forces me to depend on Jesus. I am far more aware of Christ, attentive to Christ, and thirsty for Christ when I am discouraged. Trapped in a rough patch, the psalmists’ words suddenly spring to life: “As a deer pants for flowing streams, so pants my soul for you, O God” (Ps. 42:1). “My flesh and my heart may fail, but God is the strength of my heart and my portion forever” (Ps. 73:26). Only when I thirst for Jesus do I bend low to drink his living water. And so, paradoxically, in sadness I find the key to joy, which otherwise I might blithely miss. Sadness gives me humility and empathy. Depression has a way of humbling me like nothing else, as God protects me from my own ego. It’s hard to feel you’ve arrived when you struggle to even get out of bed. In these moments I need grace like I need water, a knowledge that keeps me face-planted before the cross—a posture infinitely preferable to the kind of humiliating crash that often flows from pride. Empathy lets me see the world from a brokenhearted perspective—it lets me borrow broken eyes. Am I compassionate? It’s only because I so deeply need mercy. How can I withhold this gift I’ve received and need more of each day? I meet homeless families, unemployed immigrants, teen moms, couples mid-divorce, suicidal folks, jilted sweethearts. Every one has the same needs, the same sinful soul, the same shy beauty of God’s image imprinted on their heart. When I see them, I see me. God redeems my sadness as he turns my eyes outward and fills me with compassion. Sadness rescues me from silliness. Joy is not inferior to gloom—emphatically it’s not—but it’s easy in all the levity to miss the grand epic as it unfolds. Like hobbits happy in the Shire while Sauron advances, we can forget the stakes—life is short, eternity beckons, souls hang in the balance. A healthy dose of sobriety helps me see the world as it is: cursed and lost, in need of a Redeemer. Sadness prepares me for future struggle. How often does a rootless faith blow away in adversity? A quick survey of spiritual giants indicates they have this in common: They’ve suffered. In various ways, to various degrees, they’ve driven those roots down ever-deeper into the love of God, so that when the storms of persecution or tragedy arrive, they’re prepared. They know from repeated experience where to find living water in a drought. Sadness is God’s way of strengthening me. Jesus, who holds the galaxies together by his power, demonstrated another kind of strength as he was stricken, smitten, and afflicted. And in his mercy, he lends us a measure of his strength when we suffer. When we’re weak in ourselves, we’re strong in him. When I fall into the pit of despair, I’ve learned to look up, to seek light, to cry out for deliverance, to long for home. It’s a struggle I may face all my life. That’s okay. God is at work, and I can trust him. Catherine Morgan is a church planter’s wife in Aurora, Colorado, and the author of Thirty Thousand Days (Christian Focus). You can read more at her blog. If we know Hillary lied about Benghazi, and if we know there is a dead American ambassador, who pleaded for more security, on her watch, and if we know she concocted shrill fictions about her email server no less than four times even under oath on one occasion and, “under penalty of perjury” on a different occasion, and since it is obvious that Hillary stated publicly that she wanted everyone to see her emails and then deceptively used Bleachbit after that to acid wash those emails, and if it is blatantly obvious that foreign investors and foreign countries like Algiers, Kuwait, Qatar, United Arab Emirates, Saudi Arabia and Oman gave to the Clinton Foundation to gain favors before, during and after Hillary was Secretary of State, and if it is also easily apparent that Hillary illegally made way on her Foundation for personal gain, and if is it also blatantly obvious that Hillary used her position as Secretary of State for pay to play schemes, and if it is obvious that Bill is an alleged serial sexual predator, and if we know that Bill was impeached for perjury and obstruction of justice, and if Obama’s liberal policies have resulted in 94,391,000 people out of the workforce with Hillary continuing the same liberal policies, and since Barbara Streisand has graciously promised to vacate our country if Trump is elected, and if we also know that Hillary desires to afford immigrant Syrians careers in Detroit which is shock treatment to unemployed Americans, and if we know that Hillary will appoint rubber stamp liberals to the Supreme Court who will give her a free pass on everything she wants even if it is not constitutional which upsets the balance of power the Founders built into our system, and having clearly seen that Hillary will continue Obama’s policies of trashing our First Amendment, Second Amendment and the Constitution as a whole, and if it is 99.99 percent predictable that Hillary, like Obama, will use the IRS to attack political opponents and politicize the DOJ so carelessly that justice plays no role whatsoever, knowing that the next president is going to have to deal with an empowered terrorist Iran because Obama gave them up to 33.6 billion dollars which is easily the most diabolical thing any president of the United States has ever done, and if we are thoroughly appalled that George Soros spends millions on top of millions on top of more millions of dollars to manipulate American politics and American elections with Hillary’s tacit approval, and if we know that Hillary did not even pay attention to the level of classification on her emails thinking the “C” was some sort of alphabetical sequence which speaks to her gross lack of competence or her desire to intentionally deceive the American public, and if we know that feckless Hillary allowed hackers to obtain classified information due to her negligence, and if we know that Russians donated to the Clinton Foundation and then those same Russians purchased American uranium mines (which are strategic American assets) with Hillary’s assistance, and if we know that Hillary wants to resettle a million more Islamic migrants to America despite Islamic terrorism on our very own soil, and if we know Bill and Hillary made 153 million in speaking fees some of which was from Wall Street which reveals crony capitalism… the whole of which the New York Times considers minuscule, trite and dulcet infractions… and if it is obvious that liberal democrats and the media could care less just how deceitful and treacherous Hillary really is, all three specimens without a cure, then why on earth would we submit to CNN’s delusional, obsessive compulsive disorders and put Hillary in the oval office as the most corrupt president ever while she makes sport of our gullibility as we wax bitter under yet another corrupt leader rather than being, “deplorables,” and taking our chances with Trump who is admittedly a crap shoot (a dice game of unpredictable outcome) but not proven beyond a reasonable doubt to be a completely corrupt political weasel like Hillary… and therefore… for what do we live – to be fools governed by the corrupt? Liberalism makes idiots out of people. It is an idol. So if Jesus did not say anything about public masturbation should we likewise not condemn that behavior? If Jesus did not say anything about the joys of becoming a billionaire by dealing in international arms then is that a legitimate calling? If we are to have a correct theology then we have to consider and accept the whole Word of God. But because Jimmy Carter has an idol of liberalism then his functional god is liberalism so his theology lines up with liberalism… not orthodox Christianity. Having an “idol” is actually a technical term that violates the first commandment. The reason I posted this is because what Mr. Carter says is very irritating… it very much leads people astray. It is talked about in Isaiah where leaders, priests and prophets led people astray… into sin… which is a very serious issue. Homosexuality is condemned in about 7 different places in the Bible. But of course liberals use rationalizations, explanations, disclaimers and all sorts of subterfuge to justify sin. It is a sad thing to me that we follow men and strange doctrines rather than following God’s Word as closely as we can. And just to be fair, many republicans have idols of power, prestige, position and influence – those items are all-important to them. The US Chamber of Commerce practices greed rather than prosperity. We know this because they aligned themselves with Obama’s outrageous act of giving Iran 33 billion dollars to Iran for the purpose of US companies (Boeing) tapping into Iran’s need to replace its airliners. Iran is a terrorist nation so what we have here is pure greed. But that was all done behind the scenes… not out in the open. 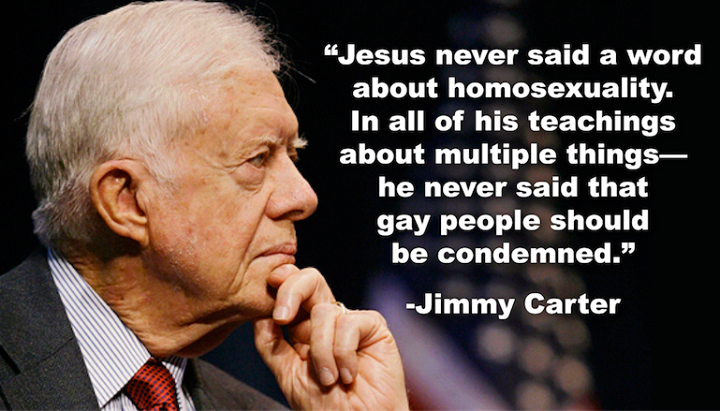 Jimmy Carter displays his ignorance for all to see and people will miss God’s grace and experience God’s judgment because of it.